A coordinate system is a reference system for spatial data to be related to a particular space on the Earth's surface. It is made up of a number of components such as projection (http://en.wikipedia.org/wiki/Map_projection), geoid (http://en.wikipedia.org/wiki/Geoid), datum (http://en.wikipedia.org/wiki/Datum) and units (http://en.wikipedia.org/wiki/Units_of_measurement). Each feature that is processed by FME knows what coordinate system it belongs to at all times. This helps prevent confusion when reading multiple datasets that belong to different coordinate systems. When working with FME, you generally only have to consider the coordinate system if you want to reproject the data to another system or if FME fails to automatically recognize the correct coordinate system. Coordinate systems are defined in the Workbench Navigator. When the source Reader coordinate system is marked <not set>, FME tries to determine the coordinate system from the source dataset. 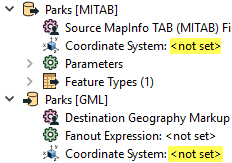 When the destination Writer coordinate system is marked <not set>, FME will not reproject the data. Instead, FME writes the data using the same coordinate system as the source data. Each Coordinate System parameter is linked to FME's Coordinate System Gallery. Double-click the parameter to display a list of recently used coordinate systems, or More Coord Systems to access FME's Coordinate System Gallery. If you explicitly define the coordinate systems, FME automatically restructures the data at the end of the translation, so that the output is in the correct location. If your data has a coordinate system defined, it will display in the FME Data Inspector, in the Feature Information window. Esri Shape and Geodatabase dataset coordinate system names are prefaced with an underscore. This is done so that the Esri coordinate system well-known text (WKT) that is read from the source can be included in the coordinate system definition, ensuring that an Esri-to-Esri conversion retains the exact coordinate system definition. _FME_0, _FME_1, etc. are used when the coordinate system on the source data does not match any of the CS-MAP coordinate systems. In this case, FME creates a temporary coordinate system for use within the conversion. KML_COORDSYS_0, SKP_COORDSYS_0 are used for 3D models stored in Google Earth and Sketchup datasets. These models are stored in a local coordinate system referenced to a latitude and longitude. FME creates a custom local coordinate system from the lat/long, allowing these datasets to be reprojected into standard coordinate systems. If a coordinate system is specified in both the source format and the workspace, the coordinate system in the workspace is used. The coordinate system specified in the source format is not used, and a warning is logged. If a source coordinate system is not specified in the workspace and the format or system does not store coordinate system information, then the coordinate system is not set for the features that are read. If a destination coordinate system is set and the feature has been tagged with a coordinate system, then a coordinate system conversion is performed to put the feature into the destination system. This happens right before the feature enters into the destination writer. If the destination coordinate system was not set, then the features are written out in their original coordinate system. If a destination coordinate system is set, but the source coordinate system was not specified in the workspace or stored in the source format, then no conversion is performed. The features are simply tagged with the output system name before being written to the output dataset.